Do you suffer from red, irritated or itchy eyes? Do your eyes burn, sting or feel gritty after using the computer for long periods of time? Have you been experiencing episodes of watery eyes or blurred vision? Have your eyes become very sensitive to light? Do you ever have the sensation that something is in your eyes? If you answered “yes” to any of these questions, you may have dry eye syndrome. Dry eye syndrome (also known as dry eye disease, keratoconjunctivitis sicca, keratitis sicca, or simply dry eye) is a condition in which the eyes do not produce enough tears to lubricate and nourish the cornea, the front surface of the eyes. Or, the eyes may be making enough tears, but the tears evaporate too quickly. Tears are necessary for maintaining the health of the cornea as they wash away foreign matter in the eyes, keep the surface of the eyes smooth and clear, and reduce the risk of eye infection. Without enough tears, your eyes will become dry and irritated. In some cases, people with dry eye actually have chronically watery eyes because of an imbalance in the systems that maintain drainage on the ocular surface. Left untreated, dry eye syndrome can lead to eye infections, corneal ulceration and scarring, and even vision loss. It has been estimated that there are at least 40 million dry eye sufferers worldwide. In fact, dry eye is one of the most common reasons people visit an eye care professional. Some researchers report that 38 percent of people seeking medical treatment for their eyes suffer from dry eye. These stats are unlikely to go down anytime soon. Studies indicate that the prevalence of dry eye syndrome has been steadily increasing worldwide over the last several decades. The increase in the number of dry eye sufferers has been attributed to a number of factors, primarily related to lifestyles and work habits. 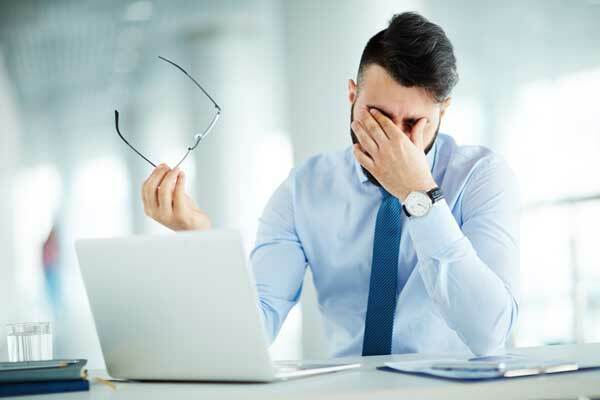 One factor is the increased use of air conditioning systems and forced air heat in homes, restaurants, stores, office buildings and automobiles, all of which can dry out your eyes. Another factor is that most people today are spending more time working on computers and using smartphones. The problem is, as you stare any type of computer screen or digital device, you blink less. Blinking is critical for eye health, because that motion distributes the film of tears over the surface of your eyes, which keeps them lubricated and moist. Studies have shown that blink rates may decrease up to 60 percent during computer usage. When this happens, the tear film is replenished less frequently and evaporates more quickly, leading to dry eye syndrome. Additionally, more individuals than ever before are wearing contact lenses. Research has shown that long-term use of contacts can dry out the eyes as the contacts draw moisture from the tear film to keep the contact lens hydrated. This can predispose contact lens wearers to developing dry eye syndrome..
Several other causes can be at play as well. Living in an arid, dusty or windy environment can cause the tears to evaporate tears more quickly than they should, leading to dry eyes. So can repeated or excessive exposure to the sun, smoking (cigarettes or cigars), or long-term exposure to second-hand tobacco smoke. Certain medical conditions can cause the eyes dry out. Patients with lupus, rheumatoid arthritis, ocular rosacea, Sjogren’s syndrome (a triad of dry eyes, dry mouth, and rheumatoid arthritis or lupus), thyroid disorders, or vitamin A deficiencies are all more susceptible to developing dry eyes. Dry eye disease can be a side effect of taking particular medications, such as antihistamines, decongestants, antidepressants, certain blood pressure medicines, Parkinson’s drugs, and birth control pills—all of which can reduce tear production. While dry eye syndrome can affect people of all ages, it is much more prevalent in people who are 50 years of age and older. With age, your glands simply slow down the production of tear film. Women are more likely to develop the condition than men, particularly those who are going through menopause. This is due to a woman’s hormonal changes at this stage of life. The suffering linked with this condition is substantial and gets worse if left untreated. However, early and proper intervention can slow, halt, or even reverse disease progression. Patients with mild or moderate cases of dry eye syndrome may get relief by applying artificial tear eye drops (these can be used as little or as often as necessary). Available without a prescription, lubricating eye drops may alleviate the dry, gritty feeling or foreign body sensation associated with dry eye. If that doesn’t provide enough relief, your eye doctor may prescribe prescription eye drops which not only lubricate the eyes, but also increase your tear production. Steroids might also be prescribed to provide more immediate short-term relief. Various at-home treatments may also make your eyes function and feel better. Taking omega-3 fatty acid supplements can reduce the inflammation that contributes to dry eyes. Applying warm compresses over your closed eyes can soften the glands along the eyelids so that natural oils can flow into the tears, which will prevent evaporation. Using eyelid washes (available over-the-counter) can help keep the glands along the eyelids clean and unblocked. Using a humidifier at home will add some moisture to your indoor air, which will lead to less drying out of your eyes. Drinking at least 8 to 10 glasses of water each day will keep your eyes and entire body more hydrated. Preventative measures are also important. If you’re going to be outdoors on a windy day, especially if you are near sand or are in a dusty area, wear wrap-around sunglasses. Don’t smoke, and avoid smoky environments. If none of the above remedies work, your eye doctor may suggest an ophthalmic insert. These are tiny cellulose beads that are placed just inside the lower eyelids. The inserts contain a lubricating ingredient that slowly dissolves and blends with your own tears, to provide continuous lubrication to your eyes throughout the day. Questions or concerns? Give us a call! There’s no reason to struggle any longer with the discomfort, inconvenience, and potential health risks associated with dry eyes. Treatments are available to bring you the comfort and relief you need. Call the Atlanta Vision Clinic today at +971-4-348-6233 to schedule an appointment with Dr. Ashraf. He will be able to determine exactly what is causing your eye problems, and then provide you with just the right treatments to get you feeling better and improve your vision.